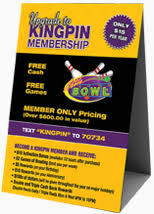 Bowling Rewards’ card-less loyalty program is ideal for merchants that want a full featured loyalty engagement system but can do without the plastic cards. It’s also ideal for businesses who want to offer cards to patrons as optional without making them a requirement. Under a card-less loyalty configuration, the patron’s mobile phone number uniquely identifies their loyalty account. No cards needed. No downloadable app required. Nothing could be simpler. Approve an activation bonus in the form of a cash reward or free low cost item your customers will find appealing (e.g., $5 reward or 2 Free Games of Bowling) upon successfully enrolling into your loyalty program. Approve a unique keyword (i.e., "bowl300,", "strike") on our short code that patrons will text to register their account. Advertise your program the Bowling Rewards Way, with beautiful, head-turning graphics we’ll design for you such as the table tent to the right. Our Creative Services department will customize any marketing visual aids you need. Push your unique keyword and/or online enrollment link through existing print, digital and/or social media to raise awareness about the new program and enroll customers. Patrons text your unique keyword to our short code or register online and we collect important marketing data such as name, email address, birthday, anniversary, even league affiliation(s). Watch our Introductory Video to take a closer look at how this process works. Processing card-less transactions is easy because patron mobile phone numbers act like a card-swipe. Clerks just need to enter the patron’s mobile phone # into a compatible terminal application. For most quick serve restaurants and retail checkout counters where POS integration and PCs are NOT available, we recommend the ease and customer privacy of a VeriFone PINPAD where customers can privately enter their mobile phone number when prompted by the clerk. This solution avoids customers at the checkout counter being forced to divulge personal information to others waiting in line. Entering the mobile number acts like a card swipe and then the clerk can process any sales and/or redemption transaction desired. 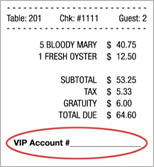 For full service restaurants where POS integration is not available, we recommend modifying the sales receipt with a new custom field such as “VIP Account #_____________” where patrons can enter their mobile number to receive sales credit or request a rewards redemption. It’s also a great conversation starter when customers ask “How do I get a VIP Account #?” and your wait staff can refer them to the table tent that describes your loyalty engagement strategy in more detail. We are gift and loyalty specialists and can customize all kinds of solutions to fit your marketing needs. Please contact us anytime for a free consultation and discuss your gift and loyalty marketing requirements in greater detail.